Typical projects in Rudiments III include candlesticks and ornamental scrollwork.Taking the classes Rudiments I, Rudiments II, and Rudiments III is the equivalent of taking The Basics of Blacksmithing class. Students should have taken Rudiments of Blacksmithing II. Fee: $390; a discount applies if signing up for three sequential Rudiments classes at once. Class size is limited to 4 students (one per forge). 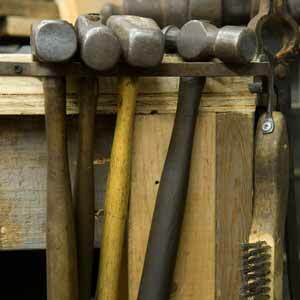 Gift Certificates for Rudiments of Blacksmithing III are available. So far, 1 student has applied to be in this Rudiments of Blacksmithing III. When you loaded this page, there were 3 spaces left in this class. So far, 5 students have applied to be in this Rudiments of Blacksmithing III. This class appears to be full and has 1 on the waiting list.